Growth and the faces who make up the Goleta council were at the forefront Friday afternoon during the 11th annual State of the City address. Mayor Paula Perotte used her speech to highlight the recent growth of the area and to credit the work of two council members who were elected in 2016. Acknowledging UC Santa Barbara’s growth, Perotte touched on the topic of new housing and development in Goleta, suggesting to “stop and deal with the impacts of recent growth,” including critical services to residents such as road capacity, water, parking, recreation and public safety. Perotte advocated for enhancing the character of Goleta while following a sustainable course of growth that is “appropriate” with the planning tool that establishes expectations for Goleta’s future as well as its natural and built environment. She again noted Kasdin and Richards. Sustainability, road and sidewalk improvement projects, and other infrastructure work were common topics addressed by Perotte. In addition, continuing to develop plans for Old Town Goleta upgrades as well as an increase in recreational space and High-Intensity Activated Crosswalk signals were mentioned. 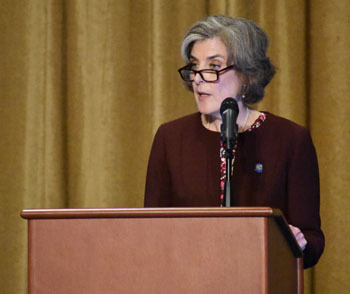 She addressed the effort to reduce vehicle traffic congestion with the peak-hour Amtrak Pacific Surfliner passenger train and noted Goleta’s looming environmental challenges such as monitoring hydrogen sulfide and dealing with transportation and the “possibility” of oil drilling. The decommissioning of Venoco’s assets — Platform Holly off the coast of Goleta and the Ellwood Onshore Facility processing plant near Haskell’s Beach — “will need attention,” she said. The mayor spoke of the city’s direct management and operation of the Goleta Municipal Library starting July 1, and noted the goal of improving library services. She also emphasized the Monarch Butterfly Inventory and Habitat Management Plan at the Ellwood Mesa to protect the safety of trees, sensitive habitat and public. In her overview of the city’s financial outlook, City Manager Michelle Greene said Goleta’s financial picture is stable, with the projected revenues at $25.7 million and the projected expenditures at $24.8 million. Goleta’s general fund is expected to end the fiscal year with an unobligated balance of more than $1.2 million, she said. According to Greene, the city’s transient occupancy tax, or TOT, sales tax and property taxes make up 85 percent of Goleta’s total revenue. TOT generated about $8.6 million in the 2016-17 fiscal year and was expected to generate $9.2 million in the 2017-18 fiscal year, according to Greene. The projection reflects an increase in TOT related to the opening of hotels operating in the city and room occupancy spiking during Santa Barbara County’s twin disaster events, she said. Greene said sales tax posted a slight increase, producing $6.5 million in the 2016-17 fiscal year to a projected $6.5 million in the current fiscal year. “Despite the growth, the city remains conservative in its projections for future years because we are seeing the impacts of online sales on traditional brick-and-mortar retailers,” Greene said. Change in the retail landscape means shifts in sales tax allocation, according to Greene. She said property tax is expected to increase slightly this year, rising to about $6.5 million. Among other encouraging numbers, she said, the unemployment rate is 3.9 percent in Goleta. Planning Director Peter Imhof briefly spoke at the event.